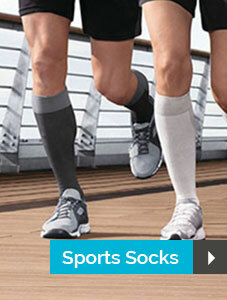 Welcome to the Compression Stockings website. We are the UK's destination for compression stockings and compression garments. If you are looking for the best compression stockings brands, we have a full range of items that will meet your requirements. We stock Medi compression stockings, Sigvaris compression stockings, Jobst compression stockings, Venactif compression stockings and Juzo compression stockings in all sizes, colours, compression levels and styles. Get in touch with the Compression Stockings team for more information about compression stockings. We're here to help! Our fantastic compression stockings knowledge centre will help you choose the right product for your needs. We hope you enjoy using the Compression Stockings website, and we look forward to being of service to you soon. Sign up to the Compression Stockings newsletter for information, guides, deals and special offers.